Swimming lessons will be offered in April and May - 8 lessons for 35 minutes at a time. An adult responsible for each student must be present at all times. Three different skill levels will be offered. One instructor will give instruction to a maximum of four students at one time. Instructors and students will be supervised by the director of aquatics or the assistant director. Instructors will have completed swim instruction training by the director of aquatics holding more than 25 years of swim instruction experience. Classes are offered at four different levels to meet the comfort level of the student. Three year olds must be potty-trained. Level 1 Non-swimmer adjusting to pool life. Learning to put face in the water. Level 2 Student has no fear of the water, submerges face in pool, and is ready to learn to swim! Level 3 Student swims for 10 yards, lifts head to breathe and is ready to work on a proper freestyle and backstroke technique. Learning all things competitive swimming! Starts, turns, and the four competitive strokes. Swimmers compete at an end of the season inter-squad meet. Though there is no age requirement, the student must be able to swim 25 yards (the length of O'Neal's pool) and be able to listen to group instruction. NOTE: New FDSL swimmers will need to schedule an evaluation prior to enrollment. Receive a $10 CREDIT when registering for all SUMMER swimming programs by May 31st. Summer swimming lessons are offered in two-week sessions Monday-Thursday, 8 lessons for 35 minutes at a time. Students ages 3 and 4 must have a responsible adult present at all times. Four different skill levels will be offered. One instructor will give instruction to a maximum of four students at one time. Instructors and students will be supervised by O'Neal Aquatics staff well as a certified lifeguard at all times. Instructors will have completed swim instruction training by the Director of Aquatics holding 25 years of swim instruction experience. Level 4 Student can swim freestyle with side breath and backstroke for 15 yards and is ready to learn the 4 competitive strokes. O’Neal’s indoor pool was built as part of the private school's first brick and mortar building in 1975, just four years after O’Neal was founded in 1971. 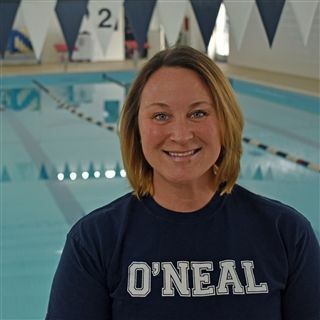 From that time, swimming has always been a part of O’Neal’s physical education curriculum with swimming classes starting in kindergarten. O’Neal’s varsity swim team has won many consecutive state and conference championships over the years, with many Falcons (past and present) still holding state records. The pool of more than 40 years was recently renovated and named the Aquatics Center at Taws Hall. O’Neal is now ready to expand its offerings to meet the needs of students at all levels - preschool, elementary school, middle school and high school. Members of the Sandhills community may take advantage of swim lessons offered throughout the year, and afterschool swim league as well as its new swim club The Pelagics. For more information about swim lessons, after school and summer swim league or the year round swim club, please contact us via email at swimming@onealschool.org. "I’ve been so pleased with O’Neal’s swim lesson program. The instructors are amazing. They’re patient, encouraging, and make swimming fun. Plus, the small class size allows them to provide individualized attention to each child. My son’s confidence grows with each lesson!" -- Melissa F.